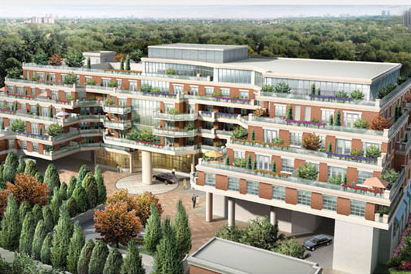 1717 Avenue Road is a new luxury condominium complex in Toronto by Tribute Communities and Turner Fleischer architects. Located in the in the heart of the prestigious North York property market at Avenue Road and Fairlawn Avenue, this boutique style condominium is exceptional in its design with spacious terraces that provide quiet private retreats with spectacular vistas of Toronto. A common terrace also extends from the condo's lounge and bar. An extended hotel-style port cochere grand entranceway delivers you to the stunning lobby, which is finished in natural limestone, marble, rich wood and burnished golds. Art and exotic accessories add the right amount of sophistication, while sensual textures create a dramatic effect. Founded over 25 years ago, Tribute Communities is a leading builder of new homes and condominiums with a mission to create distinctive, visionary communities. Their exquisite lowrise communities are enhanced by natural beauty, old-world charm and a friendly ambiance and their condominiums are vibrant expressions of urban style, with iconic architecture, sophisticated designs and spectacular amenities. Builders of the Queen & Portland Condominiums as well as 1717 Avenue Road, Tribute Communities received the J.D. Power "New Home Buyer Satisfaction" award twice in the last five years. The company was also awarded the Ontario Board of Trade’s Business Achievement Award in the large business category, given to companies that embrace the best business practices and management processes in the province. Home buyers will be pleasantly surprised at the level of finishing and detail that Tribute Communities has painstakingly undertaking during the construction phase. The 7-storey 1717 Avenue Road Condo features two collections of suites – the Avenue Collection and the Garden Terrace Collection. The Avenue Collection is on the first four floors, with one-bedroom-plus-den to two-bedroom-plus-den layouts. The Garden Terrace Collection takes up the top two floors, and features two-bedroom-plus-den layouts with large terraces. 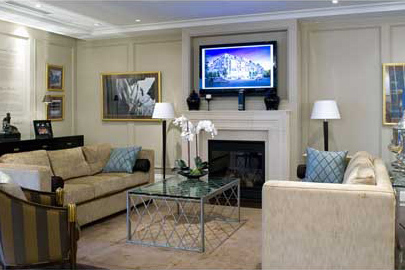 Suites range from $600,000 to $2,000,000 and are of generous dimensions. Traditional styling combined with contemporary chic designs create a uniquely elegant, yet comfortable setting. A hotel style Porte cochere entranceway leads into a spectacular lobby. The opulence continues into the exclusive Avenue Club, a luxurious space designed for the ultimate in fitness, leisure and recreation that includes workout facilities, a party room, and a movie screen room. 1717 Avenue Road's luxurious theme is extended to the 24-hour concierge service, valet service, and a suite for guests. Tribute Communities also partnered with RioCan to develop an active retail frontage on the streetscape which includes a Bank of Montreal, Rexall Pharmacy and shoe retailer "Walking on a Cloud". 1717 Avenue road is located in the Bedford Park-Nortown neighborhood at Avenue Rd north of Lawrence West in the tree-lined streets of North York. There are many gourmet restaurants and fine supermarkets nearby as well as an LCBO. Children that reside at 1717 Avenue Road will enjoy the mature trees and numerous parks in the neighbourhood and are eligible to attend several prestigious schools. Want to Buy a 1717 Avenue Road Condo? 1717 Avenue Road could be the perfect choice for your next home. With our office just minutes away, we are uniquely suited to help you navigate all the options of settling in one of the newest luxury developments in North York. We know the market value of the units, know the neighbourhood, and the community, and we may even have access to pocket listings (that is, properties that are not yet on MLS). Are You Selling a 1717 Avenue Road Condo? We have a reputation of getting the best prices for our clients in the least amount of time. We are up-to-date on the latest and most effective marketing tools and, because we are so well known and respected as Harvey Kalles agents, other agents go out of the way to work with us. Here are some of recent offerings for 1717 Avenue Road. Have a look also at the list of condos that we recently sold nearby. Contact us if you would like to be on our mailing list or if you would like to take a closer look at 1717 Avenue Road Condos and Townhouses! We produce a monthly newsletter that provides updated information about this community.